Paul invited me here, due to a beating I was taking at another forum. Closed minds simply couldn't get around the idea that I was bringing forth and the original purpose of my post turned into an argument, which I chose to stay out of. Paul stepped into the middle of it and argued in my favor, then sent me a PM to email him later. I have posted parts of this on other forums, and have gotten a few answers here and there. I have sort of summarized my thoughts and findings. If you recognize this from other locations, I have refined what I have learned and brought a lot more content into the main post. I have been looking into a (relatively) cheap way to produce a home for the last few months and I have most recently been looking into the Post-Shoring-Polyethylene method pioneered by Mike Oehler (of the $50 dollars and Up Underground House fame. www.undergroundhousing.com). I have his book and have read it cover to cover several times. It looks like a highlighter exploded in it now, with all the side notes I’ve taken. For those of you who aren’t in the know, I’ll summarize a bit. The basic principle is to take a heavy duty wooden structure (preferably designed to withstand the inward pressures of the weight of the earth involved) shore it up, and cover the outside with polyethylene plastic (I’m looking at pond liner myself). Then slowly back-fill dirt against the plastic and eventually cover the entire structure, leaving obvious spaces for windows, doors, etc. The dirt covering the plastic negates the damage that is typically done by UV and weather on plastic sheeting. I have access to a few wooded acres, a pile of (mostly) maple logs that have been ever so neatly stacked about a mile away, and a chainsaw or 2 (maybe three if I work on one). My wife works for a plastic manufacturer, so its likely that I may have access to some more inexpensive sheeting than average. The design requires a few creative paths to provide adequate lighting so that you’re not living in a tomb (which is better than the usual path of south-facing windows and blank back wall, prone to leaks and dungeon-like gloom). Obviously a lot of emphasis goes into structure and drainage. 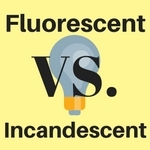 A lot of emphasis also goes into design, so that there is adequate light and ventilation. The design I'm working with makes use of light and ventilation in all directions, creating cross breezes, and utilizing the winter sun as often as possible. This would eliminate a lot of the usual underground house (dank cave/cellar) issues. Rob Roy (a big name in the owner builder movement, better known for cordwood building than underground) suggests putting foam insulation around everything. His reasoning is essentially this: The ground is just thermal mass. It is a poor insulator. It cools and warms seasonally. By providing insulation around your UH you separate your thermal mass from the earth, which is prone to (slow seasonal) temperature swings that are not always within our comfort levels. 46 degree earth may not be cold when compared to the outdoor temperature of -15, but it’s still cooler than most people find comfortable as a living space. Ever sit on a 46 degree toilet? Yeah, you know what I mean. Rob uses the analogy that an underground house is just like an above ground house that's in a different climate. Instead of being in a climate where the temp may swing from the 100's to below zero, it rests in a climate where it gradually swings a few degrees over several months. That doesn't mean that the "underground climate" is a comfortable temperature all year round. Usually it’s a little on the cool side and the house needs to be insulated, otherwise its like trying to heat a tent in that same type of climate. In short your heat is being bled off into the earth. If you insulate (and he suggests all six sides; even below footings if possible) then you keep your heat inside a small envelope. Add some thermal mass to keep your heat inside the envelope and a little heat goes a long ways. A small wood stove to warm the hands in the dead of winter may be enough BTUs to keep the whole thing heated. I plan to insulate about a foot beyond the walls (provided that I can keep that soil relatively dry) to provide adequate thermal mass so that I may not have to heat much at all. I also wanted to note for those of you who are interested in these things, the water and power situations have been considered as well. There’s a hill about 150 yards to the east that’s 35 feel higher. There is an old homestead there. All the buildings and structures have fallen in except the old windmill and well. Im planning on cleaning (if it's structurally sound) the old well and building a ferrocrete tank (cistern?) for the windmill to pump into and let gravity feed water into the house (may have to supplement with a pump if pressure isn't enough). I’m hoping it would deliver enough to at least flush toilets and keep the faucets running if power wasn't available. Showers might not be feasible though without pressure supplement. A power line runs along the edge of the property which means I'm going to have to bury electricity for about 150 feet. I'll probably work on some alternate energy project later down the road, but that is not within my price range right now. I've planned to use natural lighting as much as possible and plan for situations where electricity isn't available by removing as much reliance on it from the initial design (like the water situation). I even have an experiment running using the Jean Pain method for heating the water and probably the house itself without power if that's even needed. If it works out this winter, that may change the way my design goes from here on out. Maybe I'm barking up the wrong tree, but I look at it like this: if I live in it ten years and it costs me $10,000, that's about $83.00 a month. Compound what that saves in heating and cooling costs, I figure about $25.00 a month in the 3 coldest winter months and $35.00 in the 2 hottest summer months that’s $145 a year or about $1450 over the 10 year duration, making it a $8550 total investment. If nothing else it saves me enough to build something different. Mike has lived in his for over 30. If I can make it to 30 years for $10K that’s about $28.00 a month, and saving $4350.00 in energy costs (that’s at today’s prices).If it lasts 50 years, it’s free. (Wishful thinking, I know). Oh, and I’m not in an area where building permits are required, so I can be a bit more free with my design than I would otherwise. So that’s my plan in a nutshell. Lots of labor involved in this project. But I have a lot more time than I have money. So here’s the question: Has anyone here tried this particular building principle to see if its sound? I just want some real world facts. If anyone has any links or resources that I should look at I would appreciate it as well. As a side note I have thought about termites. I'm working ways around it but if anyone has any ideas I'm all ears. I know they're pretty diligent little critters, so quite a bit of thought needs to go into that. One person suggested plastic underneath but that would be hard to do I think. I was pointed to a forum where one owner/builder is constructing his own. It provides a lot of pictures and gives a more visual idea of what is possible. There is so much natural light in several of the pics that it’s difficult to remember that it’s an underground house. The builder is a mod at the www.countryplans.com forum. Thread link Here. This article may have some bearing on what you're trying to do. Be sure to go down to the very bottom of the page and click on "Requested Paper for the Global Sustainable Building Conference 2005, Tokyo, Japan, Sept. 2005" for more details. It sounds like you're planning on buying an existing house and moving it to the site, is that correct? I don't have any excruciating interest in underground homes, but I've read about a few. And if memory serves (always an iffy thing), all of them seemed to have an outer shell of stone or concrete. EXACTLY how do you intend to deal with the termites? I just have a funny feeling that it isn't possible to bury a wooden structure underground without them causing a major problem. My main issue is the weight of the (rain-soaked) soil on top of a termite-damaged support structure. Great strides have been made in thin-wall ferro-cement in the last twenty years or so. Do you think it would be possible to place a wood-framed home on a concrete pad, and then form an outer shell of concrete? It might not have to be very thick... maybe. It's an interesting concept, but without an ironclad plan against the termites, I'm not sure this would be feasible. And I don't think being trapped (sorry) underground with poisons would be a good thing. Have you ever investigated stone/concrete slip-form building (I think that's what it's called)? I know there is at least one book on the subject, although it may be out of print. Build your perimeter and supports this way, then backfill it the way you planned? I would like to hear more about this, what your final plan is, how you do it, etc. Low-cost housing is something that many people would be interested in. way cool Have you considered a shipping container instead of the wood structure? It would cost more most likely simply due to the hauling of the container unless you can do that yourself (I'd sure as heck give it a shot) But I think that you mgiht could pick one up pretty reasonably. It would be reliabley strong and would simplify a more interesting floor plan. You have a lot of important issues here, but your initial post is sooooooo long that it's hard to address them all in one big post. Would it be okay to ask you to start a few different threads. I want to talk about the other forum in this thread. If you could start a thread about insulation and the PSP style in another thread, that would be great. I have the videos and plan on watching them soon. About the other forum: Yeah, that was weird. That forum is a really great forum and I've been using it for years. But they have seen a lot of folks get burned by crazy ideas, so in a way they are trying to be helpful. I think if you referred to this style of building as "PSP" it might get better reception. You could mention that it costs far less than underground houses and that it is far faster than underground houses, and it appears to not have all the problems that underground houses have. Just an idea. Yes! 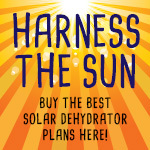 That annualized geosolar is fantastic stuff! Unfortunately, it does not mix well with the PSP stuff. PSP has no cement. It is logs (from your property) + wood planks + black plastic. Inside your home, it looks kinda like a wood cabin. 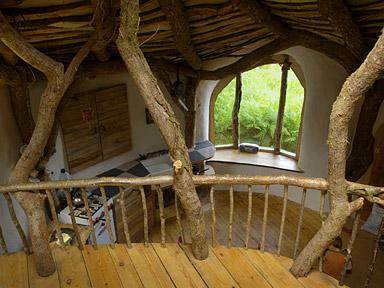 But the real magic is with the windows facing uphill. It sounds wacky at first - but once you understand how it works, it seems (to me) to be damn smart. I think a buried shipping container would not do well with a lot of soil on it. I know you haven't had time to read all through the thread so you my not realize that the original idea is to use wood covered inplastic. I figured it would hold up as well as wood if not better and it would fix the termite problem without having to use nasty treated wood in quantity. I would personally want to do concrete block despite the additional costs because I wouldn't want to have to find a new house in ten years. AS he stated though supposedly mike has lived in his for 10 years...but...it looks like he is trying o make some $$ so that msut be taken with that info in mind. quittrack I really really get the the "more time than money" thing and have considered some strange ideas in an effort to just save enough for a few years so that I can move on to what I really want. This idea in particular except using concret block has stormed through my head more than once. i think insulation is prudent as rob suggested. It will be easier to heat but not without need for it. as for whether it is a sound building practice I don't htink that is a yes or no factor. If every aspect of the job is carefully considered and constructed than yes. If you choose to be as cheap as possible and take short cuts everywhere than no. sound building practice implies that it can last safely for some time and a structure like this if not worked out ine very detail wouldn't fit the bill. New Thread: Shelter Brainstorm Bucket. The trick is that once steel starts to rust, it can keep going without further water. Now, I could be wrong about this, but I think I'm not. So! With that wee bit of rust you already have, it will just keep going and going. That's what I have always understood about rust, too. There is supposed to be a product that stops rust from continuing, but the cost to cover a shipping container, inside and out, probably wouldn't be feasible. Ditto on the rust. Maple logs sound good. The wood is hard and sturdy. It does however, have a pithy center in which I have found pillbugs and other invertebrates. Careful. We dropped a maple about two months ago, and the fungi started eating rather quickly. I agree that your major concerns are drainage and drainage and structure. I think, before structure, materials are very important. Conifers seem to be the most successful according to Oehler. I realize I'm resurrecting an old thread, but wanted to comment on the buried shipping containers idea. 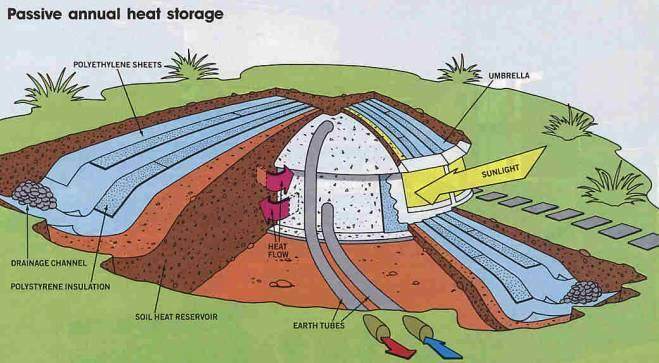 This has been discussed on TB2K by several people wanting something to use for an underground shelter (storms, etc. ), and people who are knowledgable about them say they aren't strong enough to support the weight of the dirt. I've got Mike Oehler's book, too, and hope to be able to use it someday. the walls very well may not be strong enough I guess. but I am still unsure about the wood in an underground house. having just replaced a wall yesterday and finding termite damage on cedar posts that are set on concrete I have a hard time imagining that there is a way to keep your house from being eaten up. this may be a regional thing though. just about everyone around here has regular termite treatments to keep their house intact. if there is just a tiny crack in the a slab foundation or a little "trail" of dirt leading to the ground then the termites eat your house. Yes, termites could be a problem. In the northern Rockies where Mike Oehler lives, I don't think termites are much of an issue, and they aren't really an issue here where I live, either (Oregon's high desert). But in the South, I think they would definitely be a problem. If I lived there, I'd build with cement, for protection against both termites and storms. Regarding termites, I've noticed that depending the type of soil you have, termites are either encouraged or discouraged. I'm on sandy, loamy soil, the termites just love it here. My house has been on sentricon for years. Someone I know lives in west Tulsa. Her soil is very heavy clay soil. She's lived in the same house for 22 years. No termite protection, never seen any. That termite map makes me wonder whats up with Wisconsin? How do the termites know the difference between southern Wisc. & northern IL or southern Minn? Seems curious to me. somewhat recently we suspected termite damage and had someone come out. he found a little but said we didn't have extensive damage and he also pointed out that the only reason we had any is because of a crack in our foundation around the garage that made a dirt trail to the wood. he basically said as long as there concrete between the wood and ground (no soil build up to it or anything) then the termites will leave it alone they have to have a subteranian(sp?) path to it. they suggested just a "spot" treatment near the crack. we have heavy clay soil my point is that her no termite problem may be due to something other than the soil although I have heard they prefer loose soil as well which makes sense since they live in the ground. "That termite map makes me wonder whats up with Wisconsin? How do the termites know the difference between southern Wisc. & northern IL or southern Minn? Seems curious to me." There could be some other facet of the soil that they like or dislike, like acidity or lack of sulfur or something. I guess only the termites know for sure! I found it curious mostly because I'm from that area, originally. Used to go to horse shows just over the IL - WI border. If you didn't know you were crossing from one state to the other, you'd never know by looking. Crops look the same, so does the soil. Weird! Well, hmm. We have heavy clay soil here, too -- actually, it's volcanic ash, but it looks, feels, and acts like clay, so I call it clay. It's also slightly alkaline. I live with my grandmother (she's 95), and my youngest daughter, who is mentally handicapped. We moved over here from the Oregon Coast about five years ago, with Grandma's three cats. The cats had always had fleas over at the Coast -- it's a milder climate, but also the soil is more acidic and loamy. As soon as the cats were able to get outside and roll around in the dirt here, the fleas disappeared, and we haven't seen any since. 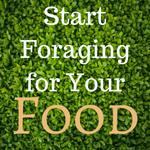 I know the climate isn't the whole story, because fleas live even in the Interior of Alaska -- one time my grandfather ran a trap-line from our homestead there (when I was small) and he brought a lynx in our house to thaw so he could skin it -- we had fleas all over the place for a few days from that lynx. I suspect the soil has a lot more to do with it than the climate, at least for fleas. Termites, now, seem to need warmer winters. I've seen them on the Oregon Coast, but nary a one here on the dry side of the mountains. What's the elevation at Las Vegas, Susan? We're at about 4,200 feet here, and it can get well below zero in the winter, although has only been down to about 10 below since we've lived here. Our soil is extremely heavy, not sand -- wonder if that makes the difference? The elevation there is 2,000 ft.
Well, in the summer, if it isn't watered regularly, it's hard as a rock! I doubt that even termites could burrow through that stuff! Termites have been my primary concern as well. I think in the long run I'm going to end up with a kind of hybrid conventional log cabin/PSP underground house. Suffice to say, there won't be ANY wood in direct contact with soil, as that's just not conducive to a long lived structure with as much soil moisture as there is here. There are a lot of considerations and concerns with any structure, but with an underground structure there are more. The upside of it all is that I won't have a conventional roof to worry about. I won't have exterior walls to paint every two/three years. I won't have to worry as much about the weather. If a storm blows through, I probably won't notice. I won't have as many heating/cooling costs. If my design is sound, I shouldn't have ANY cooling costs, and a wood fired rocket stove would likely take the chill out of the air in the winter. I go over my design a lot, do calculations on loads and stresses, look for potential places where moisture would build, look at the way air would likely flow through a room, etc. I don't have all the answers, and there are certainly pitfalls that i haven't thought of or no one else has pointed out, but I think I have the majority of the bugs worked out of the design. It does seem that with PSP there is zero wood to soil contact. Are you thinking of something different from that? I was referring to posts. They do come into contact with soil, although not as much as one might expect. I will be opting for concrete piers and footings vs burying posts, to make sure that exposure to termites is absolutely minimized. Oehler wraps his posts with black plastic garbage bags - thus preventing soil contact. My research on cement says that cement collars are sometimes worse than actual soil contact. On pilings is okay - but then you lose all the bennies of a pole structure. I live in an area with clay soil (neighbors actually have an adobe house built from the adobe thats 2-4 feet under the topsoil) and there's plenty of termites around. Exterminators in CA are using a concentrated orange oil product as a termiticide; perhaps a layer of plastic, then a layer of felt soaked in concentrated orange oil, then wood might be effective. I would think that if you are going to use sand, you can probably skip at least one layer of felt. What does the sand do to the termite? I can shed some light on this. I read the book by Mike Oehler and immediately set to work on a root cellar using that technology. Let me make my point clear as secondary perhaps only to drainage...... wood species, wood species, wood species. Being a resourceful individual, and apparently having my better judgment clouded by hope and exuberance at the time, I used, for my "sheeting", a large pile of cottonwood two by fours that I had recently inherited from a local sawmill friend. The structure did give me ten years of very dependable service before the natural and untimely deterioration of the cottonwood made it unsafe. I have since used large steel storage tanks, buried horizontally, filled partially with pea gravel to make a level floor base on which to pour concrete, for my underground root cellars. I expect to get multiple decades of service from these steel tanks, but would like to get back to more natural construction in my future projects. Do you have pictures? When you post, if you click on "Additional Options" there is a way to upload pictures here. Please, upload! In fact, PLEASE start a new thread and tell us about your experiences! I'm on a HUGE Oehler kick right now and am struggling to find existing shelters and past experiences with his techniques! Mike Oehler was at two days of Sepp workshops about ponds. 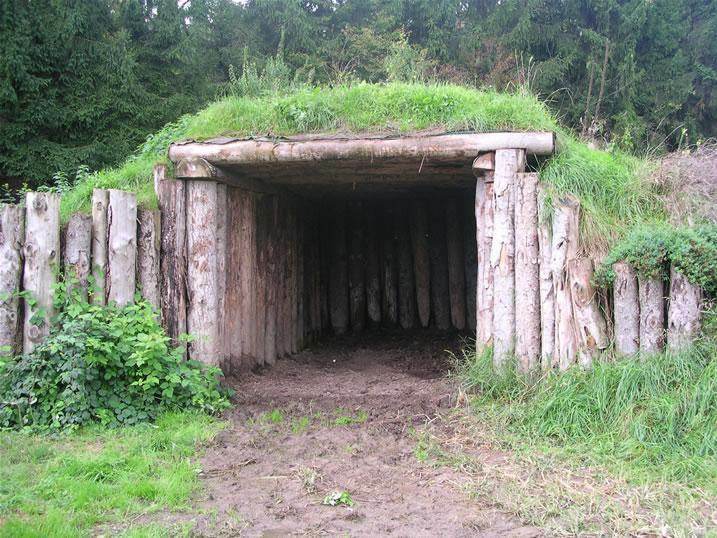 And as sepp brought up a picture of a wood shelter (like above) then Mike started to talk about the importance of selecting the right species. Paul, I don't know that my experiences are worthy of mention other than to say, don't use cottonwood for ANY underground construction, regardless of how well you might hope that you've waterproofed. I used old electric line poles for my frame, and the c-wood 2x4s for my sheeting, braced the roof with a "plus sign" cross made of oak, used a double layer of the c-wood for my roof, wrapped the whole affair in lots of plastic, backfilled with pea gravel, covered with dirt in the form of a mound, plasticked AGAIN, over that mound and well beyond the outer perimeter of the entire structure, then covered all with more dirt-- probably three feet deep at best. I'm glad that Oehler had the foresight to warn others about species type. The only pics I could scratch up were of the steel entrance and a portion of my wine collection behind which you can see the pole construction and the painted 2x4 sheeting. Between the steel entrance and the main cellar I set a round steel tank for a tunnel to get us further back in the earth. That is an impressive door. How deep is the material on the roof? You mention three feet, but that looks like less. Much less. Unless I don't quite understand the scale. As I said, three feet at best. It is a thin cover at the mouth of the tunnel. It gets thicker toward the cellar itself. How high is that opening? Just over five feet high. My tank was 5'6". We're not short people, but not giants either, so it works. My cellar ceiling is about seven feet. So I'm combining a lot of ideas from a lot of people and coming to a new space amd I just need to express it. Sepp, building a shelter in a day (above). Total cost for the structure is about $1000 (two layers of felt and one layer of pond liner) plus the cost of the track-hoe. Note that the soil is a meter deep over the structure. And then we have Mike Oehler's designs that are in many ways similar - with light coming in all four directions. I really like the idea that most of the materials come from the land. And I really like the idea that something can be built so quickly. And I really like the idea that the structure requires little, if any, heating or cooling. 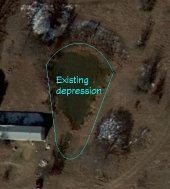 So instead of double layers of pond liner/felt/insulation that is trucked in and costs about $8000, the total cost might be about $200. Will it work? Am I brilliant? Or am I gonna die under eight tons of dirt? I'm surprised that no one has caught what Mollison calls the "Type 1 Error" of putting a house on a hilltop, no matter what type of house it is, and despite the view. "There are several thousand reasons for avoiding the temptation to site a dwelling way up on the ridge top." -- Bill Mollison, Permaculture Design Course pamphlet. He exaggerates the number, obviously, to make a point. I paraphrase: You'd be in the wrong thermal belt for one -- poor thermal efficiency. It ends up being much colder up there than if it were sighted down near the keyline, and that means higher fuel costs, more and earlier frost, higher wind, less fertile soils -- poor zone 1 plant location in general; hilltops are a fire hazard because, "fire sweeps with fantastic rapidity uphill" often from both sides, meaning there's nowhere to escape; poor choice for a well to be drilled; greater expenditure of resources and effort getting things uphill, especially in poor weather. Earth-bermed houses are terrific, but you might want to rethink the site location. Is there a post here suggesting hilltop? actually being on a hilltop prevents more and earlier frosts because the cold settles in the valley. Why earthbag, why not cob? 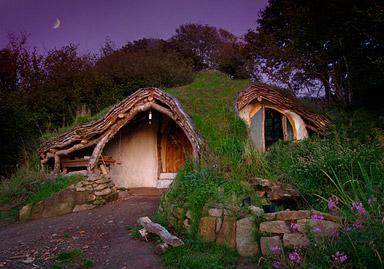 Hobbit House - could this be wofati? what makes black locust last so long? Is it safe for gardens? Can solar be used as back up power instead of a generator?